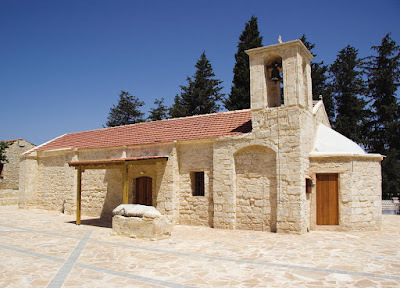 At the village of Pano Arodes in the province of Paphos on the island of Cyprus, there is located the only church in the world that is dedicated to Saint Kalandion. It's the central church of the village and was built in the 18th century. Saint Kalandion is one of the Saints of Paphos who is unknown not only in the wider Greek world, but also in the other districts of Cyprus. According to the Cypriot chronicler Leontios Machairas, who lived during the 15th century, this Saint is one of the Three Hundred Alamanni Saints who came to Cyprus in the seventh century when the Saracens conquered Palestine and Syria, countries that were then major centers of monasticism. 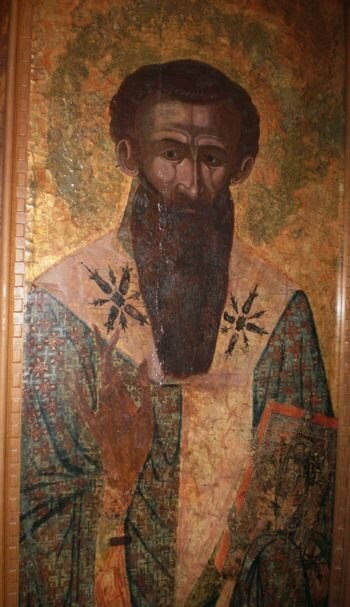 Saint Kalandion was bishop of Antioch, and after losing his flock, he came to Cyprus along with Saint Agapios and Saint Barlaam, who decided to live from then on as hermits. According again to the historian Machairas, these three Saints lived as ascetics in the village of Arodes in Paphos. "...in Arodes there is Saint Kalandion, Saint Agapios and Saint Barlaam...". However, it should be noted that there was a Patriarch of Antioch between 479 and 485 whose name was Kalandion (often translated as Calendion). 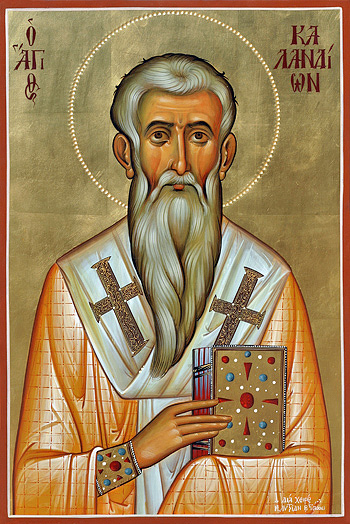 Kalandion supported the results of the Synod of Chalcedon, but refused to accept the Henotikon of 482, through which the Emperor Zeno attempted to reconcile the pro- and anti-Chalcedonian sides. This was because Kalandion regarded it as a covert attempt to overturn the Synod's holdings. Kalandion ended the schism in Antioch by bringing back the relics of Saint Eustathios to Antioch from his exile in Philippi. Kalandion supported the rebellion of Illus in 484, and as a result was deposed and banished by Zeno shortly thereafter to Oasis in Egypt, being replaced as Patriarch by Peter II. It is perhaps this Kalandion that was honored in Cyprus on April 26th, since he is not honored by the Church at any other time and could have even went to and even reposed in Paphos of Cyprus. Whatever the identity of Saint Kalandion, because of the miracles they did, they emerged as Saints after their death and the faithful built a church in their name. South of the church there is a marble sarcophagus, bearing the name of Saint Agapios or Agapitikos. This sarcophagus must belong to the said Saint Agapios. To the north, there is another sarcophagus bearing the name of Saint Misios or Misitikos. The latter name was changed by superstitious inhabitants. In older times, the priest of the village used to scrape some dust from the cover of the tomb of Saint Agapitikos, whose name is translated as "love", which he then plunged into holy water and in turn was drank by the person who was looking for love. Today, many people scrape the dust themselves without the mediation of the priest. For those seeking hate, they scrape dust from the cover of the tomb of Saint Misitikos, whose name is translated as "hate". Chances are that it really belongs to Saint Barlaam. The memory of Saint Kalandion is celebrated on April 26. The Holy Service of the Saint was issued in Alexandria, Egypt in 1914.